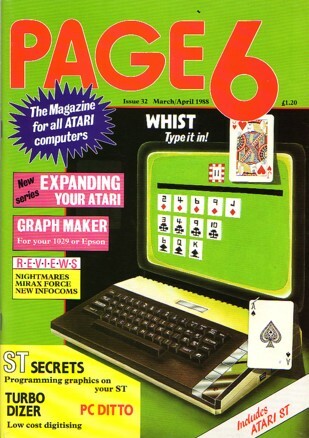 Page 6 - Issue 32 - Infocom - Ahead Or Behind? Infocom - Ahead or Behind? Infocom continue to produce some of the best text Adventures in the world. They started off 1987 well with the excellent Bureaucracy and Planetfall, both worthy of a place in any adventurer's collection. They continued with Lurking Horror and Plundered Hearts, both of which are, again, straight text Adventures of the kind at which Infocom have excelled for so many years. Admittedly the four adventures are all very different, partly because of the different styles of the authors, but also because they cover a diverse range of genres — The Romantic Novel, Gothic Horror, Science Fiction, and ... urn ... well, Douglas Adams' Bureaucracy is just Different! Despite all being excellent games, they are all straight text Adventures in the world-renowned standard Infocom style. There are no surprises in the presentation, game-play or facilities of any of these games. 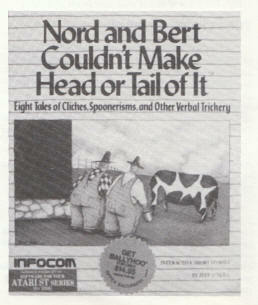 There has been talk for some time that Infocom may be beginning to fall behind in technical innovation and the use of the power of the 16 bit machines but then came Nord and Bert and, hopefully by the time you read this, Beyond Zork. Both are innovative, but in very different ways. Let's take a look at each of these most recent adventures. The adventure is set on the campus of the GUE Tech. No, it's not a coincidence that George Underwood Edwards and Great Underground Empire, (setting of all the Zorks), have the same initials, but sad to say, there aren't any Grues. Most of the action does in fact take place deep below the campus when, while investigating the disappearance of various members of the university, you discover that the underground passages linking the various buildings of GUE Tech lead deeper than anyone suspected. You soon discover they lead to blood-stained altars, pits with terrifying inhabitants and ancient tombs. It all seems to have something to do with the Alchemy Department! Along the way you pick up a companion to help you in your troubles, a sort of pet, but I won't reveal what, just that Mr Lebling has a most gruesome mind — yeucccch! The packaging is up to Infocom's usual high standard and includes a helpful manual, a Fresher's Guide to GUE, your student ID Card, and your very own personal monster, which sticks very nicely to the side of an ST screen! Since Infocom stopped classifying their adventures I don't believe they have produced any as hard as the ones they used to class as Advanced or Expert, I would class this as a good Standard Level adventure. The atmosphere is great, the puzzles are interesting, the implementation is excellent. Thoroughly recommended to all who love adventures and/or horror stories. He presses you against him. "But who, my dear", he whispers into your hair, "will protect you from me?". So starts Plundered Hearts! You play the part of a beautiful and genteel Englishwoman in the late 17th Century, travelling to the West Indies to care for your ailing father. The story begins with your ship being attacked by pirates. You are carried off by a dashing pirate, Captain Nicholas Jamison — better known as the Falcon! He claims to be from your father, but can you trust him? Even worse, can you trust yourself in his presence? After the introduction which covers your first meeting with the Falcon, you find yourself alone in a cabin on the Falcon's ship, which is anchored off the coast of the isle of St. Sinistra. The Falcon claims to be visiting Jean Lafond in an attempt to rescue your father from him. You have been locked in your cabin, supposedly for your own safety. Unfortunately there appears to be a traitor in the crew: the ship is drifting on to the reefs, and if the reefs don't get you then when the fire in the stores reaches the gunpowder, the subsequent explosion will! This is SAFETY? IF you survive all that you still have to reach the island and face further dangers such as treacherous pirates, a most efficient butler, savage crocodiles, and the evil villain Lafond. Plundered Hearts is full of atmosphere. It really does read like a romantic novel, full of adventure on the high seas. There are, as is usual in Infocom adventures, lots of little touches to help the atmosphere, for instance the response to a blank line is "Prithee, pardon? ", and to SAVE is "Aye-Aye"! The whole thing is very tongue-in-cheek, full of cliches and incorporating every scene you've ever seen in a swashbuckling Douglas Fairbanks movie. Even down to such lovely detail as (if you fail to escape from Lafond's bedroom): "Lafond pulls the sheets up to cover you both.... Waves crash against the base of the cliff.... You have suffered a fate worse than death!". Experienced adventurers may find the game a little easy. I don't know if I was just very lucky, but on this one I beat my previous record for an Infocom game (6 hours for Witness) by completing Plundered Hearts in well under four hours. 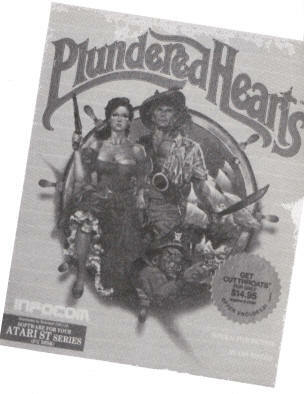 So, at its full price an experienced player may find it is not great value for money — if you are an experienced player looking for more of a challenge then I would recommend one of the older Advanced or Expert level Infocom games, but if you can afford Plundered Hearts it is great fun to play. It is well written, not excessively deadly — it gives you plenty of warning that the ship is about to crash or explode — and it just won't let you do stupid things such as walking off cliffs or into crocodiles. It is full of humour and interesting puzzles and a number of the problems have two solutions to reduce the chance of your getting stuck. These variations can in fact lead to two slightly different endings — you haven't completely finished until you Live Happily Ever After!. Definitely a good Beginners/Standard Level Adventure. Nor, apparently can a lot of people when confronted with this rather offbeat game from Infocom! Nord and Bert LOOKS like a standard adventure, but plays rather differently! It accepts commands and gives responses in the normal way, it has locations which you can move between, items you can examine and pick up and it has lots of problems to solve but if you just try and play it like a normal adventure you won't get anywhere. Although you do type in the occasional normal command (GO NORTH or GET BAG) most of the problems are solved by typing in puns, cliches, spoonerisms, well-known phrases or sayings, homonyms, or other such examples of verbal trickery! The tee holds the note firmly to the table. You grasp the tee and give it a series of mighty tugs but, as with Excalibur, it will take more than muscles to extract the tee from the table. There is a beautiful Mayan oil lamp that your father smuggled out of Central America. The ancient Mayan relic flattens out and its edges become perforated leaving a lone stamp. There is a freshly-burrowed molehill on the ground. There is a tremendous rumbling ... the molehill crumbles away ... mighty, jagged peaks emerge from deep underground. The first of those is a Homonym (two words sounding the same), the second is a Spoonerism (mixing up the beginnings of words), the third is a cliche/ proverb/ saying. Each of the games (apart from Meet the Mayor) can be played independently, and makes quite a good way of passing a few hours with a group of friends — this is definitely one where its worth getting as much help as possible. Although you should be able to get a lot of the wordplays eventually if you stick at it, I would be amazed if anyone actually managed all of them without help. Some are obscure, a few are American, and there are a couple which are not really very good, so you have to be lucky to spot them. Infocom obviously realised that it was rather difficult, so they have very kindly incorporated a full set of Invisi-Clues into the game. At any time you may ask for HINT and get a list of the problem areas in the current scenario. You can select one of these and get a number of graded clues to help you with your problem. Sometimes just seeing the list of problem areas is sufficient to point you in the right direction. A couple of the scenarios didn't quite seem to fit the 'verbal trickery' description as far as I was concerned, but most of them were good fun. There are quite a few clever puzzles to solve, and since most of them depend on wordplay they are mostly humourous. Even when you aren't successful in solving the problems the game has been programmed to respond with lots more verbal jokes to all your attempts! One word of warning. For reasons best known only to Infocom, the game refuses to load in 40-column, low-resolution mode. It insists on using 80-columns. So if you use a small TV you may not be able to read the screen very easily. All other Infocom games (to, my knowledge, and with the possible (probable?) exception of Beyond Zork) work quite happily in low-resolution. Strange! So, if you want a good 'adventure', DON'T buy this one. On the other hand if you like playing with words and are interested in a variety of amusing and frustrating challenges you will probably find Nord and Bert to be a worthwhile and unique experience. DEFINE allows you to assign a commonly used command (complete or partial) to a Function Key to save you having to type. NAME is another command to save your typing — it allows you to give a name of your own choosing to any object in the game. MONITOR allows you to see bar charts of your six attributes in a window at the top of your screen, useful for viewing your progress (especially during a fight). These are the usual sort of Dungeons and Dragons style attributes, Strength, Charisma, Intelligence, etc. and affect your ability to progress through various parts of the game. ZOOM helps you with mapping. The screen will usually display a small map in the top right of the screen showing your current location, the adjacent rooms, and any exits of which you are aware. ZOOM allows you to see more rooms, but in less detail. PRIORITY tells the game what you want to see in the top window, for instance you can get it to always show the current inventory of what you are carrying. UNDO allows you to back out the previous command if something went wrong. MODE is for the purist. It gets rid of all on-screen maps, windows, monitors, etc. and makes the screen look just like an ordinary Infocom text Adventure. You can also let the game provide you with default attributes at the beginning instead of choosing them yourself. Unfortunately, I haven't managed to get my hands on an ST copy yet — so I can't tell you yet whether or not all these new facilities make the game better or not. My guess is that it is going to make Infocom Adventures even more fun to play (if that is actually possible). I hope to be able to let you know in the near future! Infocom appear to be on the move — it can only be good news for adventurers — the next one is called Border Zone, apparently, I believe the setting is the Berlin Wall. I look forward to it.